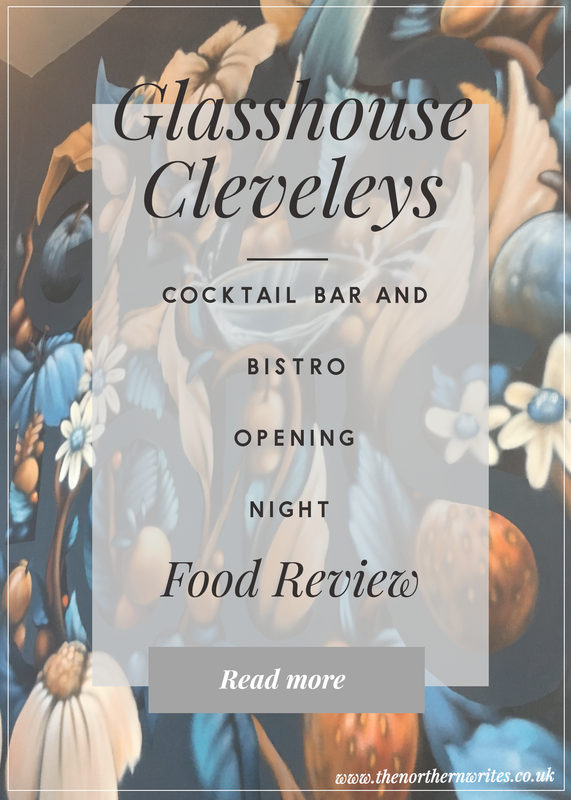 In early July I was invited by Glasshouse Cleveleys, the new cocktail bar & bistro, to attend their VIP opening evening. Cleveleys doesn’t have many nighttime venues, which is a shame. So whenever somewhere new like this opens my husband and I are always eager to show our support. It also helps that it opposite on of our favourite restaurants making this a great place to start the evening. In fact, we’d already had a chance to sample a few (probably too many!) of their glorious cocktails two weeks earlier on a previous visit. Despite this, I was intrigued to see what else they had to offer. The downstairs area is very warm and welcoming and on entering we were offered champagne and a seat at the bar. They also have a dining area upstairs where they serve a range of food during the day and early evening if that’s more your thing. The bar, however, is perfect for us as we can watch the bar staff practise their craft. One of the first things you’ll notice about Glasshouse is the artwork adorning the walls, all provided by local artists (and for sale! ), including an absolutely stunning wall mural by graffiti artist Russ Meehan running up the main staircase. The stars of the show here for me are the cocktails, and they have a very extensive menu for you to choose from. If cocktails aren’t your thing my husband also recommends their selection of beers and I noticed they have a nice selection of gins if you fancy something a little more simple. Whilst checking out the menu and enjoying the live music we had our first cocktail sample, the “Country Garden”, a blend of hendricks, st germain, apple, lime and muddled cucumber. Overall a refreshing sampler and one I’m likely to order again in the future. Glasshouse is also a live music venue, which is great to see, and hear obviously! Each week a range of local artists can be heard and it really adds to the laid-back, casual atmosphere. Check out their Facebook page to see who’s performing soon. During the evening we also had the opportunity to sample some of the food items from the main menu in “finger food” form. These varied from a lovely rare beef (my favourite) to pulled pork (my husbands). This was our first time sampling food here, as our previous visit had been a strictly “liquid” affair but if these samples are anything to go by I will be back! The cocktail samples had really hit the spot and so we also sampled a few directly from the menu (only a few this time, it was a work night!). My favourite would have to be the “Chocolate Orange Espresso Martini”. The chocolate orange isn’t that noticeable but it is lovely all the same. We finished the evening off with a classic “amaretto sour”, which we are both big fans of. Glasshouse isn’t just about cocktails though, oh no. Whether it’s dining out with friends, or a coffee on a weekday afternoon (£1 refills! ), Glasshouse has it covered. They have also just introduced Sunday Roasts, which I cannot WAIT to try. Glasshouse truly is a breath of fresh air for Cleveleys and I cannot wait to see what else they have up their sleeve. Big thanks to Hannah for making my husband and I feel so welcome on the night, we had a great evening so thanks again. Sounds a lovely place. Bit far for me to travel but if I come up that way I might have to check it out!! I absolutely love places like this, you get a real sense of community when restaurants have local artist works up and musicians playing instead of something playing on CD. Your photos really did all the cocktails and food justice, mouth watering! Your pictures are absolutely stunning and the food looks delicious! Sounds like the ultimate venue for a chill night out! This place sounds lovely! I really like your photos and those drinks look amazing. The chocolate orange one sounds fab. If only I lived closer! The glass house looks like a wonderful place to go and chill! OMG this review made want to run out and get a drink at this place! Glasshouse sounds amazing, I’m all about cocktails, definitely one of my favourite things ☺️I love that they sell the artwork on their walls too! Oh the food samples look amazing the one with the egg grabbed my attention. The drinks menu looks fab. It’s making me hungry, a great venue to try shame it’s a tad far foe me. This sounds like the perfect spot! I do love any cocktail with cucumber in it, and I’m also a big amaretto sour fan. And the food looks great, too! A good soft boiled egg makes any dish better, right? I wish I lived closer to you so that I could visit this gorgeous place! I love your photos, they’re very atmospheric and give a real feel for the venue! The cocktails sound delish, right up my street! Country Garden sounds just divine! You look fab in your red glasses as well, they’re so vibrant! Thanks very much for sharing your evening! This definitely looks like somewhere that I need to go! Oh girl this post gave me all the feels! I’m loving the photos? Yes to all of this! This looks so amazing and it’s a shame that I live so far away! Perhaps when I visit, I’ll have to check out this charming place! This is probably one of the most appealing reviews I have ever read. First off, the photos are fantastic. Definitely not something I could muster up. When I finally get to travel, this is definitely somewhere I need to go! The place looks great. 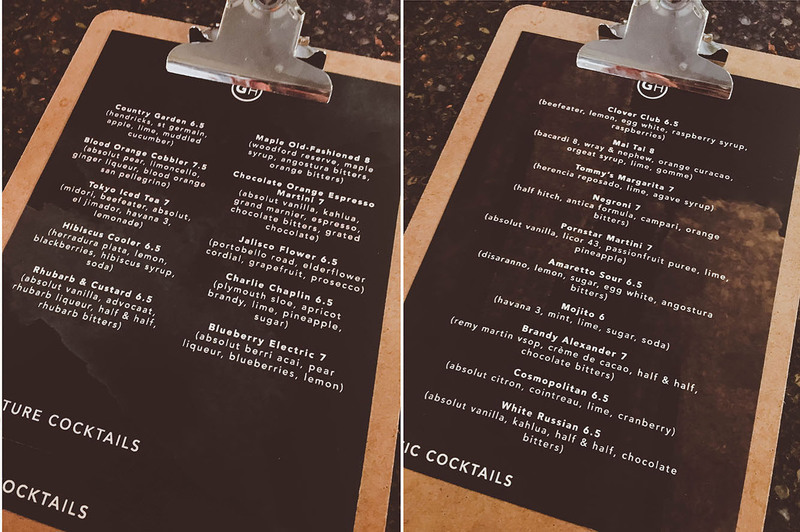 Love the cocktail selection and your photos of them! Cheers! The place looks super homey. I could imagine sipping a whiskey sour at the bar and chatting up some interesting people. I have to agree with you, that rare steak looks delicious!